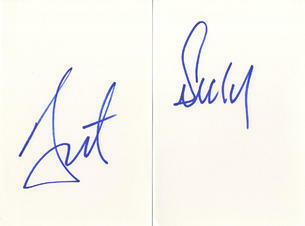 These are two individual In Person Signed white 6" x 4" cards of Ant and Dec the popular Television Presenters. Anthony McPartlin (born 18 November 1975) and Declan Donnelly (born 25 September 1975), known collectively as Ant & Dec, are an English comedy and TV presenting duo from Newcastle upon Tyne, England. The duo first rose to fame as actors on the children's television show Byker Grove, during which and in their subsequent pop career they were respectively known as PJ & Duncan - the names of the characters they played on the show. Since then, Ant & Dec have had a very successful career as TV presenters, presenting shows such as SMTV Live, Friends Like These, Pop Idol, Ant & Dec's Saturday Night Takeaway, I'm a Celebrity...Get Me Out of Here!, PokerFace, Push the Button, Britain's Got Talent, Red or Black? and Text Santa. They have also returned to acting, starring in a 2002 Tribute to The Likely Lads and the 2006 film Alien Autopsy. Ant is the taller of the two at 5'8" (1.73 m) and Dec is two inches shorter at 5'6" (1.68 m). It is a running joke that many people do not know who is Ant and who is Dec, even though their appearances differ significantly. To assist with identification, they follow the 180 degree rule; all their TV appearances and publicity photos have Ant on the left and Dec on the right, but even this does not help everyone.